Wow, so it's been over a year since I last posted. Things have changed, life has had its ups and downs and here I am back at blogging again. I'm not really sure what kind of blog this will transform into. I know that a lot are expecting my usual creative tutorials, which I will happily share once in a while since crafting is totally my Zen. But I'm not sure how craft focused it will be since I have a new focus. When 2016 started I looked at my husband and said, "2016 is going to be MY year, I can feel it." Even then I wasn't entirely sure what I meant by that statement, but I just knew it was gonna be big. I had my third baby back in July. I can't believe we will be coming up so quickly. He is such a happy, sweet little man. He fits our family so well and even my other two kiddos love him so much! Since then I lost a bit of weight, but it slowly started creeping up again. A few weeks ago a few things started to happen. It pained me to walk. My plantar fasciitis flared up terribly. I had to use crutches to get around my home. I knew it was getting worse due to how heavy I was progressively getting. That caused me to sink into a funk and feel down on myself. Also, I have an family member who is very dear to my heart. This person doesn't take care of themself at all. As a result they have diabetes, a couple of strokes, partial blindness and they have to do dialysis several times a week. Recently they had a bad injury and have been wheelchair bound. Hearing their screams in pain as they walk up my front steps to get into my home is one of the worst, heartbreaking sounds I have ever had to hear. They fell entering my home and nobody could catch them. And it terrified me. It opened my eyes...wide. I share DNA with this person. 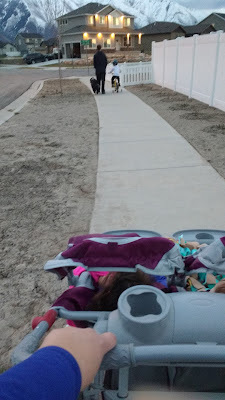 We have similar genetic factors and if I don't get myself in check...that path is right where I am headed and I don't want to do that to my kids. Since then I have lost 10 pounds. I will weigh in tomorrow morning to see if I had a loss this week. I weighed this morning and my weight didn't budge. At all. Which is frustrating since I have been logging into MyFitnessPal and keeping my calories regularly. I had two days this past week that I went over my calorie goal, but I exercised double time to make up for that number and I did so I'm not sure what happened. I know that it was a stressful week with my husband out of town so I'm wondering if stress came into play. I just don't get it, but I refuse to give up. Our first family walk with our ENTIRE family...including the dog. Even though it has only been 3 weeks I have noticed some very key things that I wanted to put out here to help myself push past the tough times and perhaps help somebody else realize that it isn't always about the number on the scale. In these three weeks I have completely gone of my anxiety medications. I am so far able to work through when I am feeling anxious or overwhelmed. In these three weeks I no longer need to rely on crutches to get around my house. My feet still really hurt sometimes but it is no longer a constant pain. I have way more energy. I feel awesome. With eating healthier foods My body just feels so good. And I love the way it feels. Don't worry I have literally had my cake and eaten it too. I am strictly in the camp of only committing to a lifestyle change that I am willing to stick to forever, and not having cake seems like hell to me. I pick and choose my sweets But I have learned under no circumstances can I have treats that I love in the house. I will binge eat them like a food challenge contestant. Maybe that will change but for now I'm ok with no treats being allowed in the house. I'm not sure what else there is to add to that list, but I'm sure it is there. My oldest is currently asleep on my shoulder snoring away so it's hard to concentrate. 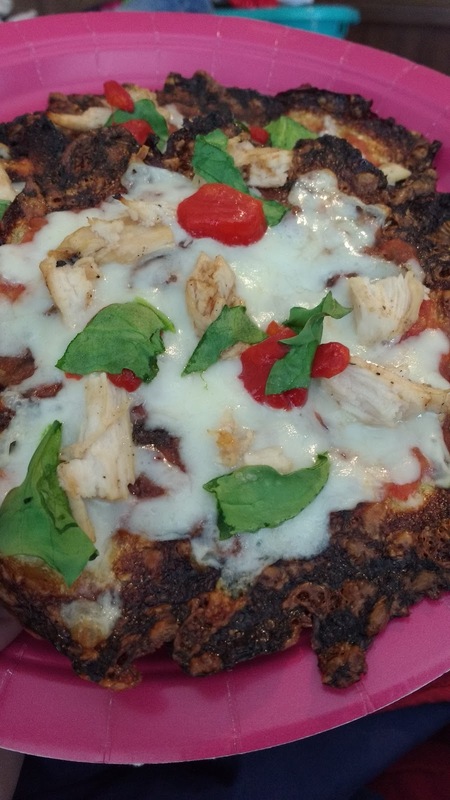 Cauliflower Pizza Crust (a little too over done but still yummy) with shredded BBQ chicken, stewed tomatoes that I blended for the sauce, mozzarella cheese, spinach, oven roasted red peppers. It is seriously AMAZING! I found these sausages at Costco. I loved that they were high in Protein and low in calories. 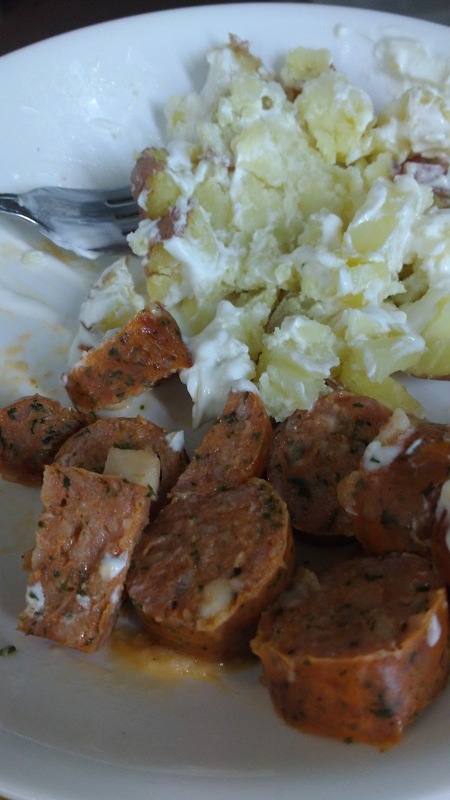 I loved it served with a baked red potato and in place of sour cream I used Greek Yogurt. It was such an easy, quick, yummy meal. I'm grateful to have it in my arsenal when I need a fast meal and don't necessarily want fast food. I also found these meatballs at Costco, they are the teriyaki ones. 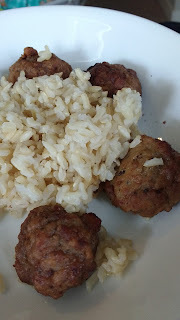 I usually would douse my meatballs in some sort of sauce but I wanted to see how I liked the flavor as well as to save some calories. Well let me tell you...these meatballs were AMAZEBALLS served with brown rice. 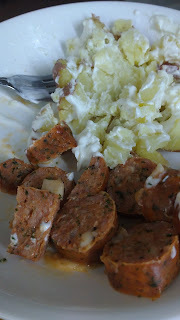 Another easy meal that I am all about. 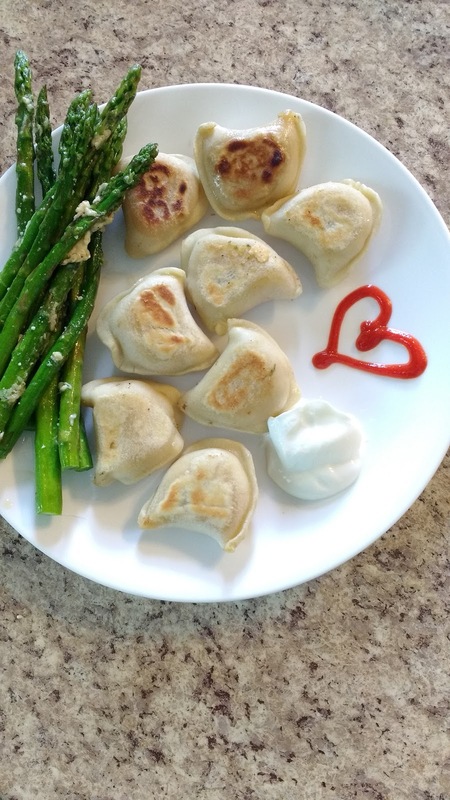 The pierogi's were REALLY high in calories for me, but I had a lot leftover in my day so it was ok for me to splurge. But the thing I loved about this meal was the ASPARAGUS, holy cannoli. You need to try out this recipe! That's basically it for me this week. I'm thinking I will probably do a weekly check in to let you know how things are going as well as to keep myself accountable. Hopefully I see a weight change tomorrow but if I don't, I refuse to quit, that is for sure!